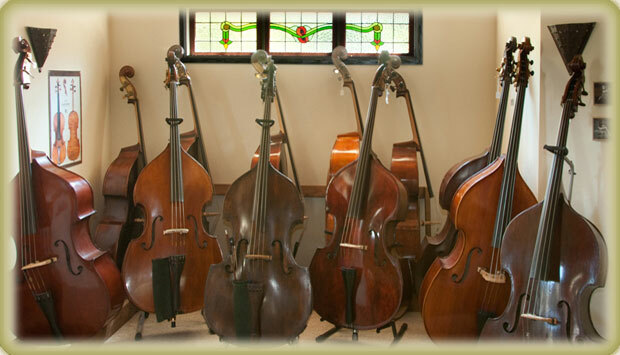 The Bass Church offers a large selection of fine new and used double basses from beginner through professional level. We also carry a wide range of bows and accessories. All of our instruments have been meticulously set up and restored using only top-quality fittings such as fingerboards, bridges, strings, and endpin units. Rental instruments are available in all sizes, each set up to professional standards. We have the most favorable rent-to-own program available. Our goal is to offer you a double bass of unquestionable quality and structural soundness that will compliment your playing and prove over time to be a worthy investment. Please call or email to set up an appointment to visit our shop. We look forward to meeting with you! email to post your event!